The International Songwriting Competition (ISC) is now accepting entries for 2007. One of the largest songwriting competitions in the world, ISC gives away over $150,000 in cash and prizes, including an Overall Grand Prize package of US$25,000 in cash and over $20,000 in merchandise. ISC offers artists the most exposure, the best judges, and the biggest cash prize, unmatched by any other songwriting competition. ISC winners benefit from extensive press and publicity, gaining exposure and recognition from an international music market of industry professionals and fans. Sugar Hill Records and the Bluegrass Blog announce the debut showing of Four days of infamy, a thirty-minute mini-documentary on the Infamous Stringdusters. Filmed by Craig Havighurst of String Theory Media during a four-day Colorado trip with the band during the winter of 2007, it shows the band on stage, backstage, in rehearsal, and in transit. The entire film, narrated by John Cowan, will be available for online viewing - exclusively on the Bluegrass Blog - on 27 August. A brief preview can be seen online at the BB now. Once the full video is up, an icon in the left-hand sidebar of the BB will help readers find it quickly. The Infamous Stringdusters are nominated for IBMA 2007 awards in the categories of Emerging Artist, Album of the Year, and Song of the Year (the Chris Jones song 'Fork in the road'). The Stringdusters are booked to appear at the Sixth International Bühl Bluegrass Festival in Bühl, south-west Germany, on Saturday 3 May 2008. The sixth annual Sweet Sunny South Festival, known as one of the premiere festivals of American old-time music, takes place at the Fairlight Lodge Hotel, Hastings, Sussex, southern England, over the weekend 7-9 September. Featured artists include Kate Lissauer and the Buffalo Gals; Nick Peachey, multi-instrumentalist and singer who plays guitar, banjo, and a host of other instruments, with an original approach to American music; and for the first time in Hastings, the Foundlings, a trio from south Wales who play fiddle, guitar, and mandolin. Tickets for the concerts on Friday and Saturday evening (£8.50 per night) are available via the Festival website or tel. +44 (0)1424 423230. As the venue is usually fully booked, early booking is advised to avoid disappointment. Thee festival weekend also includes workshops and informal picking sessions, all within a laid-back and friendly atmosphere. The 16th Annual Bluegrass Music Festival was launched on Tuesday at the Ulster American Folk Park, Omagh, Co. Tyrone, Northern Ireland. From Friday 31 August to Sunday 2 September, the museum will become home to some of the biggest names in international bluegrass music as acts like the Steep Canyon Rangers, Lovell Sisters, and Malpass Brothers rub shoulders with the finest home-grown talent. Tickets for the Festival are available from the hotline on +44 (0)28 8224 3292, while evening concert tickets and full festival information are also available at the festival website. Read the full release here. I just want to inform you that both of my books, Banjo instrumentals and The 5-string banjo in D tuning, are now available in PDF format. They are a little cheaper than the printed versions, and you save the shipping costs. If you are interested in the books, please contact me. To get more informations about them, please visit my website. Thanks to Lilly Pavlak for news and photos of the Festival Européen de Bluegrass Music, held for the second time in La Roche-sur-Foron, a medieval town in the French Alps, between Geneva (Switzerland) and Mont Blanc. A festival of superlatives!... After the rain last year, this time the weather was beautiful. The whole city beat to the rhythm of bluegrass music, with bars hosting bands for a 'fringe' festival on Thursday evening and the local movie theatre playing Deliverance. Friday was a gala concert with French bluegrass comedy act Zip Code 2025, Bluegrass Stuff from Italy – last year’s contest winner – and headliners from the US Hickory Project... On Saturday this year’s winners of the European Bluegrass Pioneer Awards were proclaimed. The beautiful handmade wooden awards went to Jaanus Vainu from Estonia, Loek Lamers from Holland, and Petr Kus from the Czech Republic. If you are planning to be in Europe for the first weekend of next August, don’t forget to stop by. For me it was the event of the year 2007! The EBMA Board with guests (left to right): Dagfinn Pedersen, Rienk Janssen, Angelika Torrie, Paolo Dettwiler, Lilly Drumeva, Petr Brandejs, Michael Zumstein, Richard Hawkins, Jon Weisberger, Richard Hurst. Photo by Nancy Cardwell. At the sixth EBMA General Membership Assembly on Thursday 17 May at the EWOB Festival, Voorthuizen, the Netherlands, the EBMA Board was re-elected for the next legal year of the association (1 July 2007-30 June 2008). The present chairman, Paolo Dettwiler, will resign in June 2008 to concentrate on other bluegrass-related projects. Two further Board members will be proposed in 2008 for election by EBMA active members. The association now has 355 paying members and an annual budget of around €8,000. A small surplus in 2006 will be set aside for future projects. At the EBMA Open Meeting on Friday 18 May, reports from members throughout Europe showed a general impression that bluegrass is clearly on the rise, with several new festivals and growing attendance numbers. The presence of Nancy Cardwell and Jon Weisberger as official IBMA representatives underlined the importance of the tenth EWOB. Also on Friday 18 May, the Board met to review its current projects and goals for the next year, and welcomed as guests Nancy Cardwell (IBMA), Jon Weisberger (IBMA), Dagfinn Pedersen (Norwegian Bluegrass Music Association), and Richard Hurst (Ulster American Folk Park). The EBMA will maintain a presence at IBMA World of Bluegrass, and will also continue to host the International Suite there. A new edition of EBMA's European Bluegrass Directory will appear in 2008. 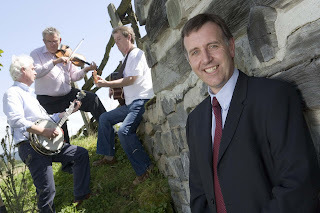 The board will meet at the 16th Annual Appalachian & Bluegrass Music Festival at the Ulster American Folk Park, Northern Ireland, with an agenda including the development of Bluegrass Europe magazine and an increase of EBMA's youth activities. Read more in the current issue of Bluegrass Europe. Roberto Dalla Vecchia, who now has his own MySpace site, will be touring the US with guitar wizard Mark Cosgrove in the coming fall. The schedule is still being completed (see below), so anyone who can propose a new date should contact Roberto. The four-day acoustic guitar workshop in Altissimo (VI) in June was a success. Photos can be seen here. Roberto also reports on his new Mannedesign DSR model guitar; on the UK-based internet radio and music community website Last.FM, one of the world's largest social music platforms, which enables users to create their own playlists; and on another acoustic-guitar-oriented website, FingerstyleWorld, with links to players, luthiers, events, etc. The Picnic Team welcome every good music lover to the Picnic Festival's new location at Terra Nova in the Citadel of Namur, Belgium, on 1st & 2nd September 2007 - a friendly, happy, and family-party-people event. Saturday remains 'Bluegrass Day' with some great bands from Belgium, Holland, and France: Jefferson Louvat & Thierry Massoubre (B, F), Quartier Francais, the Louvat Brothers & guests (B, F), Zip Code 2025 (F), and the Blue Grass Boogiemen (NL). Celtic music is represented on Sunday by Camping Sauvach, Alka Celtes Airs, La Varda, and Cecile Corbel. Links to the bands' websites are on the Picnic Festival website. All the above bands will play on the outside main stage (with shelter provided in case of rain); other bands will play in a real 'Irish Pub'. Other halls are provided for food and for children's entertainment (music instruments, toys in wood, games, etc.). The Festival also offers stands with stringed-instrument makers (Tom Nechville, Richard Baudry), good regional food, and information on hearing troubles (more details on the Festival website). MC work will be in French, Dutch, and English. Admission is free to under-14s. The Festival and details of upcoming concerts by Rawhide and the Sons of Navarone are also featured on the Bluegrass in Belgium website. The all-girl new-wave old-time band Uncle Earl will be performing in concert at 20:30 on Thursday 8 November at Erve Kots (Stone Valley), Lievelde, the Netherlands. We await news of other dates that the band may be playing in Europe. Uncle Earl is featured in the August 2007 issue of Bluegrass Unlimited magazine. For further details, contact Stichting Stone Valley Roots Music, Jacob Catsstraat 17, 7131 WP Lichtenvoorde, the Netherlands. Tel: +31 (0)544 373 701; e-mail. Tom Hanway reports that Ireland’s top country deejays are giving heavy rotation to Empty mansions (Sharpe CD 310), the groundbreaking CD by the Outlaws, a contemporary country band based in Co. Monaghan, Ireland. Empty mansions has earned 'album of the week' and the coveted #1 spot on radio stations throughout Ireland. The Outlaws blend traditional styles, including bluegrass, old-time, Cajun, Irish, Tex-Mex, and honky-tonk, into a fresh, contemporary alt-country sound. They recently toured the Highlands of Scotland, winning over new audiences, who welcomed the sound of 'a real country band', like the classic honky-tonk bands of decades ago. Tom Hanway, author of the Complete book of Irish & Celtic 5-string banjo and co-designer of the Stelling SwallowTail banjo, was banjo-player for Carmel Sheerin & the Ravens when they won the #1 European Bluegrass Band 2005 title.